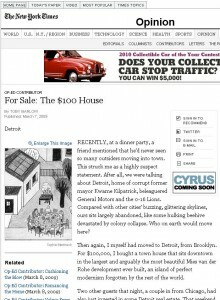 Written by Toby Barlow last year for the New York Times – an interesting observation of the state of the real estate market in Detroit and how people are snapping up derelict homes for $100. Remember though, that you get what you pay for, and before you charter a flight to Wayne County Airport, perhaps a little research into Detriot’s inner city neighbourhoods wouldn’t go amiss. For some though, one man’s trash is another man’s treasure.